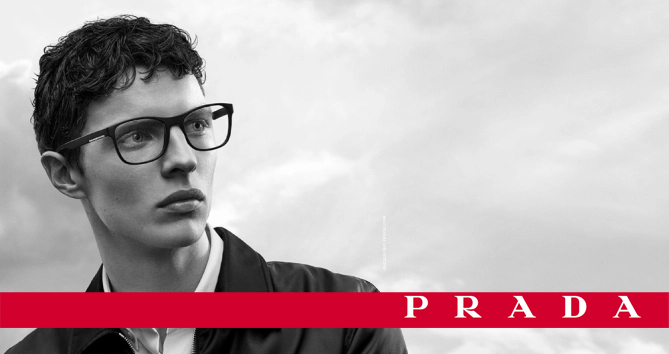 Prada Eyewear currently has two lines Prada and Prada Linea Rossa. Prada Linea Rossa is mostly geared towards men and women with very active living. All Prada Linea Rossa, formerly known as Prada Sport eyeglasses, are made from very durable materials, are lightweight and flexible to withstand high impact during wear. Prada glasses frames from Linea Rossa collections, are generally priced a bit lower than the classic Prada line, partly because Prada Sport meant as your backup or specialty wear. Nevertheless, Prada Linea Rossa is one of the best selling eyeglasses brands in the world because styles are classic and sporty that fits style of many American men and woman. Buy authentic Prada glasses on EyeInform website. Shop with confidence to buy Prada glasses with prescription lenses or simply just Prada glasses frames without prescription lenses. Buy Prada VPS 50F glasses online at a friendly price. Originally made in 2019, Prada PS 50FV are lightweight metal frames. Each pair of authentic Prada glasses ships worldwide with authenticity certificate, Prada box, case and a cleaning cloth. Buy Prada VPS 05H glasses online at a friendly price. Originally made in 2019, Prada PS 05HV are lightweight plastic frames. Each pair of authentic Prada glasses ships worldwide with authenticity certificate, Prada box, case and a cleaning cloth. Buy Prada VPS 01F glasses online at a friendly price. Originally made in 2019, Prada PS 01FV are lightweight plastic frames. Each pair of authentic Prada glasses ships worldwide with authenticity certificate, Prada box, case and a cleaning cloth. Buy Prada VPS 51L glasses online at a friendly price. Originally made in 2018, Prada PS 51LV are lightweight metal frames. Each pair of authentic Prada glasses ships worldwide with authenticity certificate, Prada box, case and a cleaning cloth. Buy Prada VPS 06L glasses online at a friendly price. Originally made in 2018, Prada PS 06LV are lightweight plastic frames. Each pair of authentic Prada glasses ships worldwide with authenticity certificate, Prada box, case and a cleaning cloth. Buy Prada VPS 05L glasses online at a friendly price. Originally made in 2018, Prada PS 05LV are lightweight plastic frames. Each pair of authentic Prada glasses ships worldwide with authenticity certificate, Prada box, case and a cleaning cloth. Buy Prada VPS 50L glasses online at a friendly price. Originally made in 2018, Prada PS 50LV are lightweight metal frames. Each pair of authentic Prada glasses ships worldwide with authenticity certificate, Prada box, case and a cleaning cloth. Buy Prada VPS 03L glasses online at a friendly price. Originally made in 2018, Prada PS 03LV are lightweight plastic frames. Each pair of authentic Prada glasses ships worldwide with authenticity certificate, Prada box, case and a cleaning cloth. Buy Prada VPS 02L glasses online at a friendly price. Originally made in 2018, Prada PS 02LV are lightweight plastic frames. Each pair of authentic Prada glasses ships worldwide with authenticity certificate, Prada box, case and a cleaning cloth. Buy Prada VPS 01L glasses online at a friendly price. Originally made in 2018, Prada PS 01LV are lightweight plastic frames. Each pair of authentic Prada glasses ships worldwide with authenticity certificate, Prada box, case and a cleaning cloth. Buy Prada VPS 55I glasses online at a friendly price. Originally made in 2018, Prada PS 55IV are lightweight metal frames. Each pair of authentic Prada glasses ships worldwide with authenticity certificate, Prada box, case and a cleaning cloth. Buy Prada VPS 05I glasses online at a friendly price. Originally made in 2018, Prada PS 05IV are lightweight plastic frames. Each pair of authentic Prada glasses ships worldwide with authenticity certificate, Prada box, case and a cleaning cloth. Buy Prada VPS 54I glasses online at a friendly price. Originally made in 2017, Prada PS 54IV are lightweight metal frames. Each pair of authentic Prada glasses ships worldwide with authenticity certificate, Prada box, case and a cleaning cloth. Buy Prada VPS 53I glasses online at a friendly price. Originally made in 2017, Prada PS 53IV are lightweight metal frames. Each pair of authentic Prada glasses ships worldwide with authenticity certificate, Prada box, case and a cleaning cloth. Buy Prada VPS 52I glasses online at a friendly price. Originally made in 2017, Prada PS 52IV are lightweight metal frames. Each pair of authentic Prada glasses ships worldwide with authenticity certificate, Prada box, case and a cleaning cloth. Buy Prada VPS 51I glasses online at a friendly price. Originally made in 2017, Prada PS 51IV are lightweight metal frames. Each pair of authentic Prada glasses ships worldwide with authenticity certificate, Prada box, case and a cleaning cloth. Buy Prada VPS 04I glasses online at a friendly price. Originally made in 2017, Prada PS 04IV are lightweight plastic frames. Each pair of authentic Prada glasses ships worldwide with authenticity certificate, Prada box, case and a cleaning cloth. Buy Prada VPS 03I glasses online at a friendly price. Originally made in 2017, Prada PS 03IV are lightweight plastic frames. Each pair of authentic Prada glasses ships worldwide with authenticity certificate, Prada box, case and a cleaning cloth. Buy Prada VPS 02I glasses online at a friendly price. Originally made in 2017, Prada PS 02IV are lightweight plastic frames. Each pair of authentic Prada glasses ships worldwide with authenticity certificate, Prada box, case and a cleaning cloth. Buy Prada VPS 01I glasses online at a friendly price. Originally made in 2017, Prada PS 01IV are lightweight plastic frames. Each pair of authentic Prada glasses ships worldwide with authenticity certificate, Prada box, case and a cleaning cloth. Buy Prada VPS 06H glasses online at a friendly price. Originally made in 2016, Prada PS 06HV are lightweight plastic frames. Each pair of authentic Prada glasses ships worldwide with authenticity certificate, Prada box, case and a cleaning cloth. Buy Prada VPS 05H glasses online at a friendly price. Originally made in 2016, Prada PS 05HV are lightweight plastic frames. Each pair of authentic Prada glasses ships worldwide with authenticity certificate, Prada box, case and a cleaning cloth. Buy Prada VPS 51H glasses online at a friendly price. Originally made in 2016, Prada PS 51HV are lightweight metal frames. Each pair of authentic Prada glasses ships worldwide with authenticity certificate, Prada box, case and a cleaning cloth. Buy Prada VPS 50H glasses online at a friendly price. Originally made in 2016, Prada PS 50HV are lightweight metal frames. Each pair of authentic Prada glasses ships worldwide with authenticity certificate, Prada box, case and a cleaning cloth. Buy Prada VPS 04H glasses online at a friendly price. Originally made in 2016, Prada PS 04HV are lightweight plastic frames. Each pair of authentic Prada glasses ships worldwide with authenticity certificate, Prada box, case and a cleaning cloth. Buy Prada VPS 04GF glasses online at a friendly price. Originally made in 2016, Prada PS 04GVF are lightweight plastic frames. Each pair of authentic Prada glasses ships worldwide with authenticity certificate, Prada box, case and a cleaning cloth. Buy Prada VPS 03H SPECTRUM glasses online at a friendly price. Originally made in 2016, Prada PS 03HV SPECTRUM are lightweight plastic frames. Each pair of authentic Prada glasses ships worldwide with authenticity certificate, Prada box, case and a cleaning cloth. Buy Prada VPS 01H glasses online at a friendly price. Originally made in 2016, Prada PS 01HV are lightweight metal frames. Each pair of authentic Prada glasses ships worldwide with authenticity certificate, Prada box, case and a cleaning cloth. Buy Prada VPS 08G glasses online at a friendly price. Originally made in 2016, Prada PS 08GV are lightweight plastic frames. Each pair of authentic Prada glasses ships worldwide with authenticity certificate, Prada box, case and a cleaning cloth. Buy Prada VPS 01FA glasses online at a friendly price. Originally made in 2016, Prada PS 01FVA are lightweight plastic frames. Each pair of authentic Prada glasses ships worldwide with authenticity certificate, Prada box, case and a cleaning cloth. Buy Prada VPS 50G glasses online at a friendly price. Originally made in 2015, Prada PS 50GV are lightweight metal frames. Each pair of authentic Prada glasses ships worldwide with authenticity certificate, Prada box, case and a cleaning cloth. Buy Prada VPS 55F glasses online at a friendly price. Originally made in 2015, Prada PS 55FV are lightweight metal frames. Each pair of authentic Prada glasses ships worldwide with authenticity certificate, Prada box, case and a cleaning cloth. Buy Prada VPS 06F glasses online at a friendly price. Originally made in 2015, Prada PS 06FV are lightweight frames. Each pair of authentic Prada glasses ships worldwide with authenticity certificate, Prada box, case and a cleaning cloth. Buy Prada VPS 52F glasses online at a friendly price. Originally made in 2014, Prada PS 52FV are lightweight frames. Each pair of authentic Prada glasses ships worldwide with authenticity certificate, Prada box, case and a cleaning cloth. Buy Prada VPS 02C glasses online at a friendly price. Originally made in 2012, Prada PS 02CV are lightweight plastic frames. Each pair of authentic Prada glasses ships worldwide with authenticity certificate, Prada box, case and a cleaning cloth.